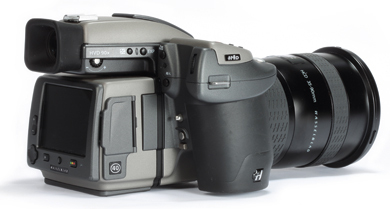 The Hasselblad H4D-40 is part of the Hasselblad modular H series of medium-format cameras. Like other digital medium-format cameras, there are two main parts: the camera, in this case with a battery forming the grip, a viewfinder and lens; and the digital back that contains the sensor. The digital backs are interchangeable, but with the cameras costing upwards of £12,000 most photographers are likely to have only one. There are currently 11 Hasselblad H-series lenses available, including the HCD 35-90mm f/4-5.6 and HC Macro 120mm f/4 lenses we used with the H4D-40. Lenses from the classic Hasselblad V system are also compatible with H-system lenses via an adapter. One of the more interesting accessories in the H system is the HTS 1.5x tilt-and-shift lens adapter. This works with five of the existing H-series lenses, giving them tilt-and-shift capabilities while retaining infinity focus. However, it costs around £3,500, so it is only likely to be of interest to professional users. There are three viewfinders available in the H system. The HVD 90x and HV 90x are 90° reflex viewfinders with slightly different magnifications. These viewfinders make the H-series cameras handle a lot more like a conventional DSLR. A waist-level finder is also available in the form of the HVM. Like most medium-format waist-level finders, this features a magnified hood to make precise focusing easier. A medium-format roll-film back is also available in the form of the HM 16-32 and even the HMi 100, which is compatible with Polaroid 100-type instant film. It may seem odd to produce these products on such an advanced digital camera, but specialist film is still used in some advanced medical and scientific applications.